I stumbled upon the website lightobject.com while looking for an affordable thermocouple for the immersion circulator I’m planning on building. I found the part I was looking for and I also came across a “Mult-function 1CH RF Remote Control Tx/Rx Set” which is a small remote controlled relay switch that runs on a 12v power supply and will switch 120v 10A. This is one of those things that I knew I had to have but had no idea for what reason, it just seemed handy to have around. Then inspiration struck. Batman, a constant source of inspiration. 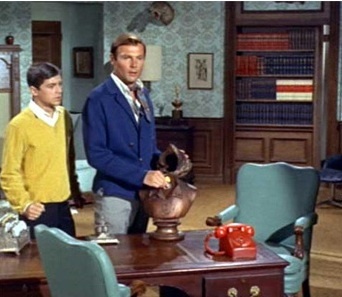 In the original Batman TV show Bruce Wayne used a switch hidden within a bust of Shakespeare to open a hidden entrance to the Batcave. While I don’t have a hidden door to open I honestly can’t think of a cooler way to turn on and off the lights to my “Mancave”. So now that I had a goal in mind it was time to gather the required parts. 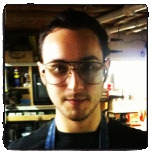 Like all good projects this one started with cutting off someone’s head with a band saw. 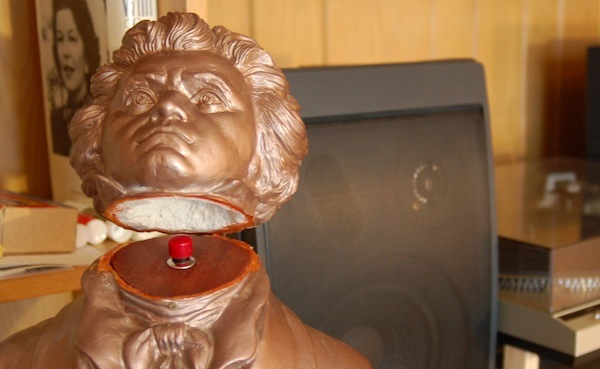 In this case Ludwig van Beethoven was the unfortunate soul to have his head separated from his body. From what I can tell, the hard outer shell was a fiberglass like material while the inside was a poured porous plaster. The plaster created a terrific mess but was pretty easy to chisel out to make room for electronics. After chiseling, I gave the plaster a nice coat of Elmer’s glue to reduce the amount of plaster dust leaking from Ludwig’s orifices. I also cut and stained a piece of plywood to act as a mount for the push button and hide the plaster. The next step was finding a cheap 12v power supply to drive the relay. I used an old power supply I had lying around, I also picked up a cheap 6 plug power strip and removed enough of the outer shield to cut into the positive (120v) line. This was extended and plugged into the relay board. Additionally I removed the wireless remote from it’s plastic casing and soldered the push button to the PCB. After mounting the push button on the plywood insert I added an extra bead of hot glue around all the connections for added support, including the battery on the remote. The last step was mounting the electronics inside the body and attaching the head on a hinge. There wasn’t too much to this part, I just drilled some holes and used old brackets, hinges, nuts and bolts to hold everything in place. This project was a lot of fun and required minimal effort. Since very little modification was required this is a great project for a beginner (like me). The relay board can switch up to 10 Amps so it can handle switching a lot more than the couple lights I’ve got it attached too. It’s also worth mentioning that you can buy additional relay boards that operate on the same frequency (allowing you to switch even more lights). The range on this remote is really impressive so in theory it could be used to turn on and off lights all over the house with the press of one button. This is one of those projects that is only limited by your creativity and imagination. Next PostNext I can barely contain my excitement.